Students crowd into "field of dreams" lots at Hardrock Stadium to tailgate with fraternities on Oct. 21. Photo courtesy Kelly Saberi. The parking lots at Hard Rock Stadium, usually an atmosphere of thousands of students in green and orange jumping up and down to loud music, will become just another tailgate lot with the closure of lots nine and 10 to student organizations as a safety precaution. Now, students are reacting to the university’s decision. Sammy Kamme, a junior majoring in microbiology, said he thinks the university’s new policy hurts not only attendance at the games but the way the university is perceived overall. On Oct. 25, Dean of Students and Associate Vice President for Student Affairs Ryan Holmes met with Greek organization leaders to announce major changes in tailgating procedures at Hard Rock Stadium for the rest of the season. A newsletter sent from Vice President of Student Affairs Patricia Whitely later that day details the changes, which include student organizations losing their reserved spots in lots nine and 10. “We have observed continuing unsafe behavior around alcohol, and we are not going to put up with it,” Whitely said in a phone call with The Miami Hurricane. The Dean of Students Office warned the organizations in question, but the unsafe behavior was still observed, Whitely said. Students who attended the Syracuse game on Oct. 22 suggested that the number of minors in possession of alcohol may have contributed to the decision. The official UM tailgate will be held at the UM Fan Zone sponsored by Student Government. All buses transporting UM students will be directed to that area. 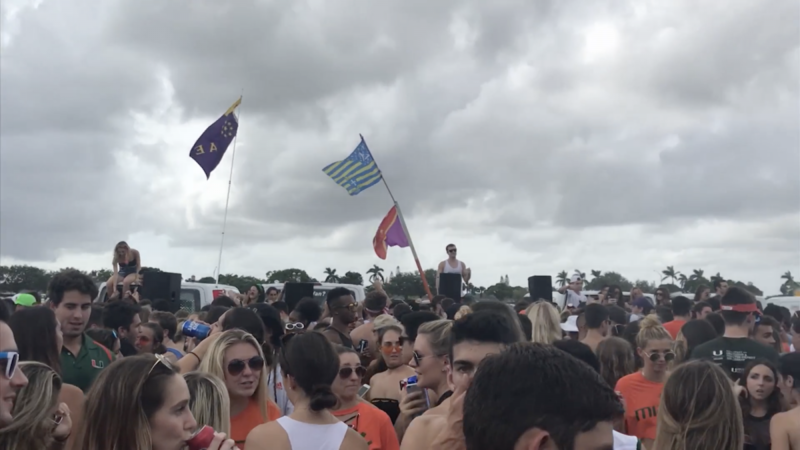 Student organizations that tailgate on Hard Rock Stadium property and create “an environment conducive to unsafe behaviors” may be delivered a cease operation order, according to the newsletter. However, for Kamme, the decision to completely bar any student organization from having an organized tailgate at the stadium discourages students from taking part in the football culture. “By reintroducing the field of dreams and then almost immediately taking it away, it discourages students from actively taking part in the college football culture at the U, hurting academic and athletic recruitment,” Kamme said. Junior Sarah Stankard, a member of Zeta Tau Alpha, said she’s not too upset about the ban because of the unsafe conditions in the “field of dreams,” the synonym used by UM students to refer to the two lots where fraternities host their tailgates. She said the she thinks the reason people are upset over the new policy isn’t about football. Whitely emphasized that this decision is not a suspension or ban on student tailgating, but the lots typically reserved for student organizations will not be available. A previous version of this story was published here on Oct. 26. Isabella Cueto contributed to this report.